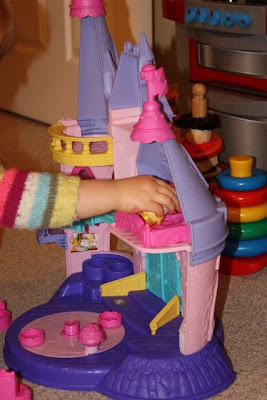 The Disney Princess Songs Palace from Fisher Price is part of the ever-popular Fisher Price Little People range. Little People in their various forms have been a firm favourite in this house ever since Lara was a toddler and the combination of Disney Princesses with Little People was one we couldn't miss when Fisher Price offered Lara the chance to review the Disney Princess Songs Palace! The palace is a very grand castle indeed and, as with many of the Little People play range, has a number of points throughout the castle which make noises when your child interacts with the toy. I think the doorbell chime is pretty neat when the grand palace doors open and close! On the reverse of the castle there are a few different rooms for your child to role-play with their little princesses. A bedroom with a double bed, a dressing room and a tall tower. There is also a moving balcony that slides up and down outside one of the towers. Inside there is a ballroom floor which plays music when you rotate it. And the most impressive part is that, when you place a princess on the dancefloor, the toy knows which princess it is and plays different voices and sounds depending on which princess you are playing with. The Disney Princess Songs Palace comes with Snow White and Cinderella included but there are lots of others that you can buy in sets or pairs, perhaps as special treats in the future. The palace comes in several parts that you have to construct yourself - trying to do so brought me to my wits end and even Lara, who had been eager to play with the toy from the minute we unwrapped it, told me to take a break and come back to it later when Holly had stopped crying!!! Armed with a screwdriver, Mr. B came to our rescue! I was also frustrated that some (but not all) of the imagery on the castle came as stickers that you had to apply yourself. Lara, being a 3-year-old girl, helped herself to the stickers and plastered them all over a piece of paper while I was building the castle - sigh. I would say that the entertainment value of the Little People Princess Songs Castle comes from the princess characters and the moving dancefloor. The dining table and chairs are really a bit big for using inside the castle itself which reduces its effectiveness as a doll's house. I also think that a little girl like Lara expects a few more pieces of furniture and accessories in a doll's house to keep her absorbed for very long. I think that as a plastic doll's house it is very sturdy and could withstand usage from children as young as 18 months but very honestly, it isn't the best quality or most exciting doll's house I've ever laid eyes on. 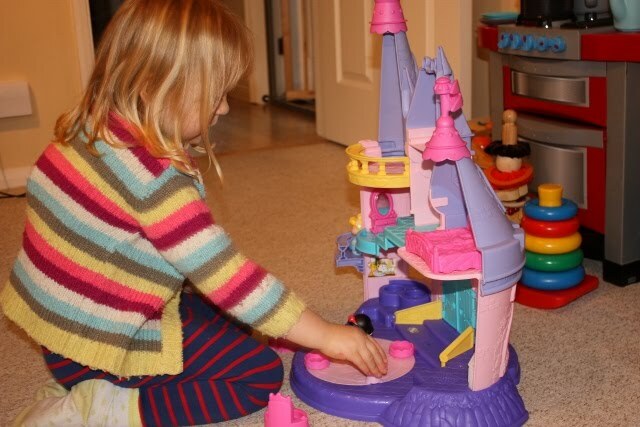 The Fisher Price Disney Princess Songs Palace costs around £49.99.